The tapered end of this brush is designed for smudging to create a modern, soft, smokey eye. Pick up Eye Shadow with brush and tap off excess. Sweep shadow close to lashline, extending slightly at the outer corner for a soft, smudgy look. 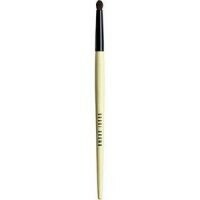 Using tip of brush will provide a thinner line; side of brush a thicker, smokier look.